NEPHO was incorporated in 1995 by New England Community Medical Group (NECoMG) and Northeast Health Systems (NHS), Northeast Hospital Corporation’s (NHC) former parent company. NEPHO and NECoMG are governed by separate Boards of Directors. NECoMG is an independent physician organization and was first comprised of 30 PCPs and 58 Specialists; there are presently 63 PCPs and 264 Specialists. NECoMG continues to include both private practice and employed physicians. The original 2 member hospitals of NEPHO remain: Beverly Hospital and Addison Gilbert Hospital. Dr. Gregory Bazylewicz was the first President of NEPHO & NECoMG; Dr. Pierre Ezzi is the current President. Dr. Philip Herrick was NEPHO’s first Medical Director. Since then, Dr. Joel Shelkot and Dr. Leslie Sebba also served this role. Dr. Louis Di Lillo is the current Medical Director. Jeanne Holland was the first Executive Director of NEPHO; others who have held the position include Nicole DeVita and Stacey Keough (the current Executive Director). In 2010, NEPHO entered into our first Alternative Quality Contract (AQC) with Blue Cross Blue Shield (BCBS). 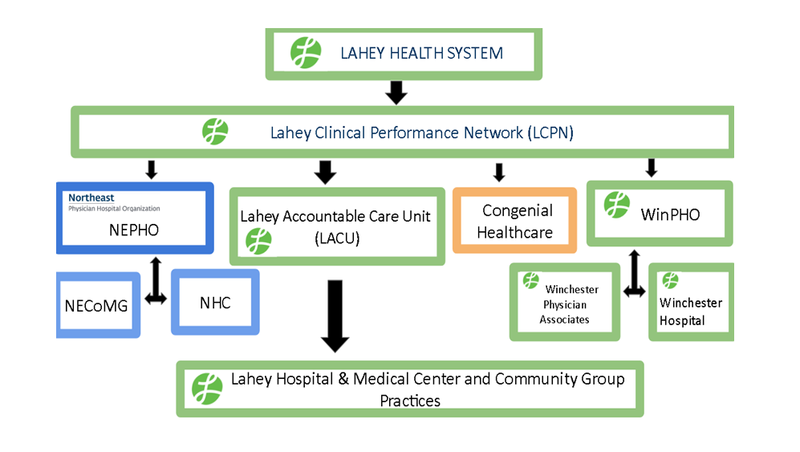 In 2012, NEPHO joined the Lahey Clinical Performance Network (LCPN) as an Accountable Care (risk) Unit (ACU). See affiliation chart below. NEPHO holds 7 direct contracts and participates in 4 more contracts through our affiliation with LCPN. NEPHO providers can also participate in the Lahey Clinical Performance Accountable Care Organization (LCP-ACO). NEPHO manages approximately 60,000 covered lives in these commercial and Medicare contracts.